Mohammed Amin explains the genesis of the euro, the origins of the present crisis and gives his forecast for the future. The article is based upon the lecture he gave to the London College of Business Management and Information Technology on 15 February 2012. Before looking at the current eurozone crisis, it helps to revisit the reasons why the euro was created, and assess the extent to which the current problems were anticipated. We all suffer costs each time we exchange money to go on holiday abroad. Such costs also arise to businesses each time goods imported from overseas are paid for in the currency of the foreign seller. When the countries now within the eurozone each had their own currency, such currency exchange costs added up to a very large amount. However by themselves they were not a sufficient reason for establishing a single currency. Importers and exporters also suffer from the risk of exchange rates moving between the time the price of an import or export is agreed and the time payment is made, often many months later. While the risk can be hedged by purchasing a currency forward contract from a bank, hedging involves costs which again across Europe added to a very large amount. However by themselves these costs also were not a sufficient reason for establishing a single currency. The key reason for Europe wanting a single currency is a different type of exchange risk, known as economic risk. It is best explained by an example. Imagine setting up a factory in France to make butter to be sold in France and Italy. The factory has costs denominated in French francs (before the euro) and revenues in French francs and Italian lire. In Italy, it competes with local Italian butter manufacturers who have revenues and costs which are entirely lire denominated. Long term movements in the franc/lire exchange rate can make the French factory uncompetitive for Italian sales, and there are no satisfactory hedging mechanisms for this type of risk. Accordingly the French entrepreneur is likely to establish two smaller factories, one in France and one in Italy, rather than a single large factory in France. The overall consequence is that industry in Europe is much more fragmented than industry in the USA, even though the European Union and the USA have comparable populations and comparable levels of industry. Everyone can think of industries such as automotive manufacturing which are much more spread out in Europe than in the USA. The different levels of concentration in manufacturing and financial services can also be demonstrated by detailed economic surveys. Higher levels of concentration are associated with greater efficiency, and if the European Union achieved similar concentration levels to the USA, there would be significant economic benefits to the whole of the EU. In the author’s view, this elimination of economic exchange rate risk was the single most important reason for setting up the euro. When some countries within the EU adopted a single currency, there were certain concerns that had been widely discussed by economists. 1. Fiscal policy, by increasing or reducing taxes and/or government spending. 2. Monetary policy, by increasing or reducing the rate of interest and the amount of money in circulation, both notes and coins and bank deposits in that country’s currency. Monetary policy can also cause the country’s currency’s exchange rate to rise or fall when measured against the currencies of important trading partners. When a country enters into a monetary union, its government abandons all of the tools in section (2) above. Instead, in the case of the eurozone, only the European Central Bank can set the level of euro interest rates, which it does taking account of economic conditions in the eurozone as a whole, not by reference to the situation in any particular country. For example, during much of the period from 1999-2008 euro short term interest rates were much lower than countries such as Ireland or Spain would have set if they had monetary independence, with the result that both countries experienced very significant increases in real estate prices. Those increases were later reversed in a property crash. Furthermore the eurozone has a much lower level of fiscal integration than the USA. For example, in fiscal 2012 the US Federal Government collected in taxes an amount equal to 16.6% of US GDP. By comparison, the central budget of the EU equals only 1.1% of EU GDP. Accordingly, the eurozone has much less scope than the USA for redistribution between regional economies that are performing well and regional economies that are performing badly. The existence of language barriers means that labour mobility between eurozone countries (though rising) is much lower than labour mobility between American states. This means that a poorly performing region is likely to experience extended periods of high unemployment even though there may be unfilled job vacancies in well performing regions in other countries. Accordingly European policy makers were aware that the countries of the EU represented a less ideal area for a common currency than did the states of the USA. However the potential benefits from increased economic integration were considered to outweigh the risk mentioned above. There was concern that certain countries whose currencies had historically tended to depreciate might run excessive government deficits. Accordingly the creation of the euro was accompanied by the “Stability and Growth Pact” limiting the aggregate size of government debt that a eurozone country was permitted to have, and limiting government deficits to 3% of GDP with an “Excessive Deficit Procedure” for dealing with governments that violated this limit. Furthermore the newly created European Central Bank was expressly prohibited from lending to governments, and given a clear priority of managing the rate of inflation in the eurozone. Shortly after the euro was created, France and Germany found themselves violating the 3% deficit limit of the Stability and Growth Pact. These two countries were the leading economies of the eurozone, and generally regarded as displaying good economic management. Accordingly the Excessive Deficit Procedure was not applied to them. Unfortunately this subsequently made it virtually impossible to apply the Excessive Deficit Procedure to weaker economies that proceeded to follow France and Germany in violating the 3% deficit limit. Furthermore the relative competitiveness of countries in the eurozone diverged. The strongest economy, Germany, transformed its labour market in the period 2002-2005 through a process known as the Hartz reforms, which abolished industry-wide pay bargaining in many industries. Meanwhile countries such as Italy, Spain, Portugal and Greece with entrenched labour market inefficiencies (which made it hard to terminate unwanted workers) proceeded to lose competitiveness. The result was weakening economic performance, greater unemployment and increasing government deficits in those countries. Historically, government bond yields varied widely in the EU, as some currencies had much higher rates of inflation and greater likelihood of devaluation than others. Once these countries entered the eurozone, the rate of inflation was the same for all eurozone countries and the risk of devaluation had been eliminated. Accordingly the only differential risk between the bonds of eurozone countries was the risk of outright default. Such default risk was regarded as minimal. Furthermore the bank regulators of the eurozone treated all eurozone sovereign debt as equally risk free. This made it profitable for banks to sell low yielding sovereign debt (for example that issued by Germany) and buy high yielding sovereign debt (for example that issued by Greece). The result was a convergence of bond yields, as shown by the chart below. Furthermore sovereign bonds of weaker eurozone countries became a more important component of bank asset holdings than might otherwise have been expected. 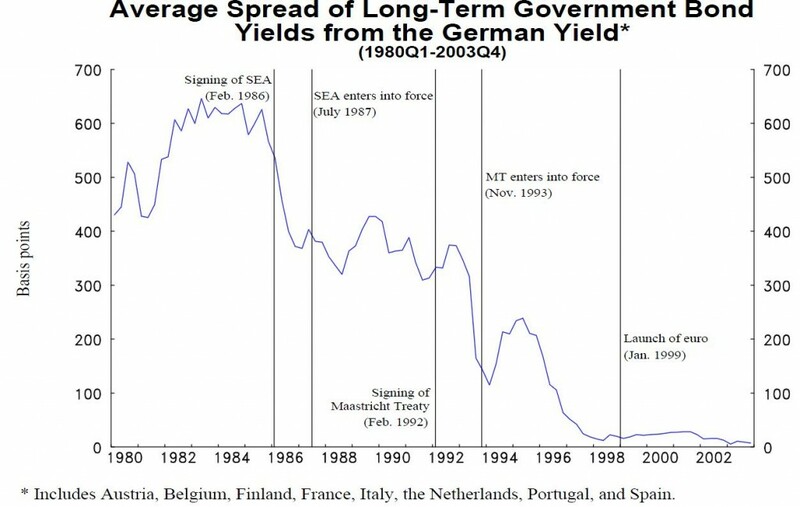 Chart from “Convergence of Government Bond Yields in the Euro Zone: The Role of Policy Harmonization” by Denise Côté and Christopher Graham, Bank of Canada working paper 2004-23. •	Greece was widely known to have falsified its government debt and deficit figures to gain admission to the eurozone. As bond investors focused on the finances of the Greek government they realised that Greece’s debt was unsustainable. The fall in demand for Greek government bonds caused Greek bond yields to soar. •	Spain was suffering from a collapse in real estate prices and high unemployment leading to high government deficits. •	Portugal also had high unemployment, an uncompetitive economy and high deficits. •	Ireland’s economy had previously performed well. However when its major banks failed, primarily due to bad property loans, the government chose to guarantee all bank liabilities. Taking over these debts caused government debt as a percentage of GDP to soar, while the decline in economic activity also led to a large increase in the government’s deficit due to falling tax revenues. •	Italy had suffered from sluggish economic growth for many years. While it had an approximate balance on its primary account (tax revenue compared with spending ignoring bond interest), its debt was large in relation to GDP. It was also of relatively short duration and therefore required regular refinancing. These distressed countries were given the unfortunate collective acronym of the PIIGS. Bond yields for the PIIGS rose significantly as bond investors became concerned for the first time about the risk of their defaulting. While some countries outside the eurozone, such as the UK and the USA, also have large government deficits, their bonds do not have any meaningful default risk since the UK and US governments can create pounds or dollars in unlimited quantities to repay their bonds. However none of the PIIGS had the power to create a single euro, and if their governments were not able to roll over their debts as they fell due, default would be the inevitable consequence. Default by all the PIIGS would wipe out the entire capital of the eurozone banking sector, bringing all economic activity within the eurozone to a halt as the banking system would cease to function. In the USA, regional government borrowers default from time to time. For example the city of Harrisburg, the state capital of Pennsylvania, defaulted on its debts in 2011. However such defaults do not cast doubt on the viability of the dollar. The difference with the eurozone is that the size of the government bond liabilities outstanding is very large, and also that a very large part of the bond liabilities is held by banks, so a sovereign default risks leading to an insolvent banking system. Collectively the eurozone is easily able to resolve its problems. It has large countries such as Germany and France (as well as others) with relatively strong economies that can borrow or guarantee weaker countries. Furthermore the eurozone countries could amend the statutes governing the European Central Bank to enable it to print euros to finance their bond obligations in the same manner that the Bank of England or the Federal Reserve System are the ultimate guarantors that the UK and the USA can always repay their sovereign bonds. However the costs of such remedies would ultimately fall upon taxpayers in countries such as Germany and France who had not caused the problems, while the beneficiaries would be taxpayers in countries such as Greece or Spain who had benefitted from excessive spending by their governments. •	Provide enough money in the form of “bail-out” funds to finance weaker countries such as Greece to avoid a disorderly default. •	At the same time, doing as little as possible, both to minimise costs to German and French taxpayers and also to ensure that the Governments of these weaker countries carry out the structural reforms necessary. For example Greece and Italy now have caretaker “technocratic” governments which are taking actions such as liberalising labour and service markets, raising state pension ages, terminating unwanted civil servants etc. Not providing enough bail-out resources risk prolonging the crisis, which also dampens economic activity in Germany and France, as well as outside the eurozone. It also risks an outright default by a weaker country if negotiations over a bail-out break down. Conversely providing too much bail-out resources risks reducing the momentum for structural reform in the weaker countries. Such structural reforms are the only way their economies can be changed to perform satisfactorily within a single currency environment. In December 2011 and February 2012, the European Central Bank supplied a total of over 1 trillion euros in three year loans to European banks at the relatively generous interest rate of 1%. Such funding was necessary as the banks concerned were having problems funding themselves in the wholesale money market. It appears that part of the money borrowed has been used by the banks to purchase eurozone sovereign debt of the weaker countries which yields far more than 1%. Such bond purchases by the banks (and possibly by other purchasers) have caused bond yields to fall, easing the borrowing costs faced by weaker countries such as Spain and Italy. Combined with the official support provided to Greece, this has eased the immediate pressure of the crisis. Once traders in eurozone sovereign debt are satisfied that the other PIIGS countries apart from Greece (which is a special case with its “voluntary” restructuring of debt) are not going to default, their bond yields should fall. This will allow time for their economies to respond to the combination of spending cuts, tax increases and most importantly structural reforms that are underway. While forecasts are always a hostage to fortune, the author does not expect the eurozone to break up, and with the possible exception of Greece does not expect any country to leave the euro. Even with Greece, in the author’s view the most probable outcome is Greece remaining within the euro.